September 1st through October 31st 2014 will mark the 2014 Strides Against Breast Cancer across Second Life season, as a part of the Relay for Life of Second Life 2014 fundraising activities. Details of the events planned for the season are a little scant on the ground at the moment – but with the official website now up and running, that is sure to change. The theme for this year’s activities is Seasons of Pink, and right now the organisers are looking for support in a number of areas. The 2014 Committee is looking for dedicated and customer oriented people to help throughout the fundraising season If you are interested in helping with either outreach activities or as a member of the marketing and events staff, please fill out the volunteer form. 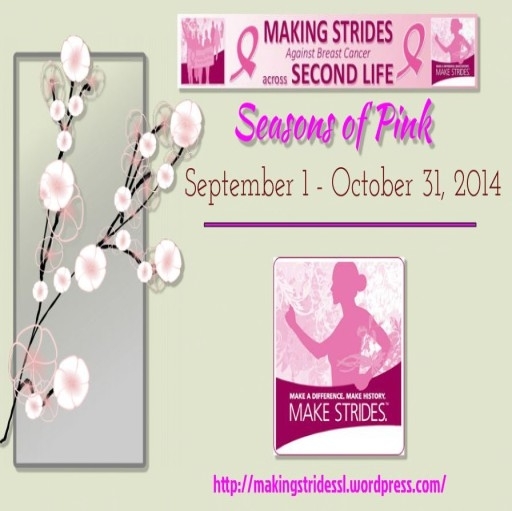 Sponsorship packages for the 2014 Making Strides Against Breast Cancer Across Second Life Event Season are now available, starting at L$5000 for a Bronze package. Sponsorship opportunities are available to individuals, groups, businesses, and organisations.For full details on the range of packages available please visit the Making Strides Against Breast Cancer across SL website sponsorship page. All questions relating to sponsorship should be addressed to Committee chair jessii2009 Warrhol in-world. The I feel, You Feel hunt will run from September 21st to October 31st, and the Making Strikes organisers are looking for creators and businesses willing to participate in the hunt and donate gifts. Items do not have to be all pink, and those wishing to provide clothing are asked to consider making both a male & female gift or a unisex item, as the hunt is for everyone. Those stores and businesses wishing to participate in the hunt are asked to complete the hunt application form, and to address any questions to Earth Nirvana in-world. Those wishing to run fundraising events on behalf of Making Strides are asked to read the event fundraising and donations guidelines ahead of contacting the organisers.